Organising a large event or gathering? 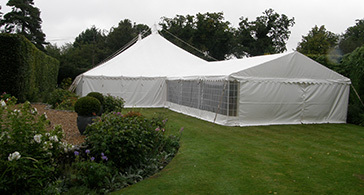 We provide marquees for both big and small events. Before you take the plunge and hire your marquee, there are certain things you need to know first, which can be seen in the section below. If you’d like more help or information with your marquee hire Peterborough, get in touch and find out more about what we can do on 01953 882 394. You need to have an accurate idea of how many people are coming to your event. Although marquees are very flexible and can accommodate lots of people both inside and outside, there is a safe limit and maximum capacity. So plan your guest list carefully before settling on your marquee. Although here at Weatherill Brothers we will do everything we can to make sure you have the perfect wedding, we do get busy. So it’s a great idea to get in touch with us and book your marquee early. That way we can be sure to accommodate you and make sure everything is perfect for the big day. Will you be needing toilet facilities? How about a bar or dance floor? As well as the main marquee we can also provide all sorts of optional extras, including air con and heating - depending on the weather. To find out more information about our other extras, please call us.